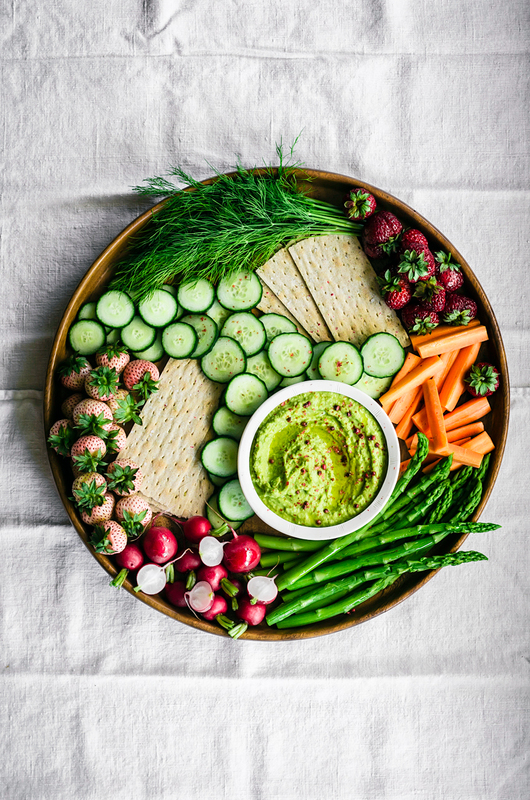 This pastel green pea hummus is made with spring peas, chickpeas, and lemon for a lighter, sweeter variation of vegan hummus. Serve with fresh seasonal vegetables and strawberries to make a beautiful spring mezze. It’s late and my body is telling me I’m tired even though my brain sees light through the window and thinks it’s not even close to full night. It’s light for over 16 hours a day here right now. Spring is fully here, edging into summer now, and that extended light means more fresh produce in the form of local strawberries, asparagus, and more. I shared a winter mezze in December, alongside sweet potato lentil hummus, and it was phenomenal so a spring mezze seemed like a good idea too. It’s perfect for small parties or an evening with one or two people as it works well with taking time to chat in between bites – it doesn’t hurt that it looks so beautiful, too. 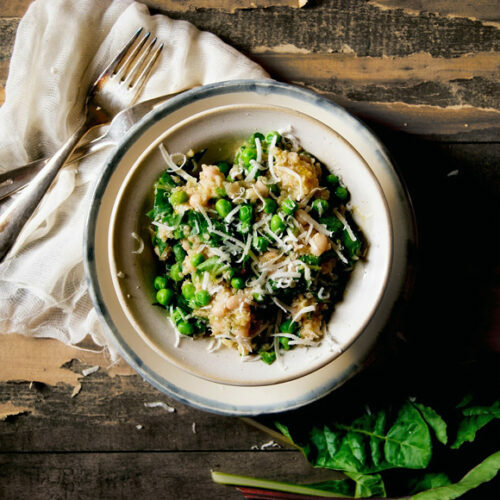 I chose to use frozen little peas, thawed, for this recipe. Thawing them is a very important step! I tried to make this once with frozen peas and it was a disaster, hah. Watery and lumpy and awful. If you’re in a pinch, just rinse the peas with hot water until they’re no longer frozen and you’re good to go. 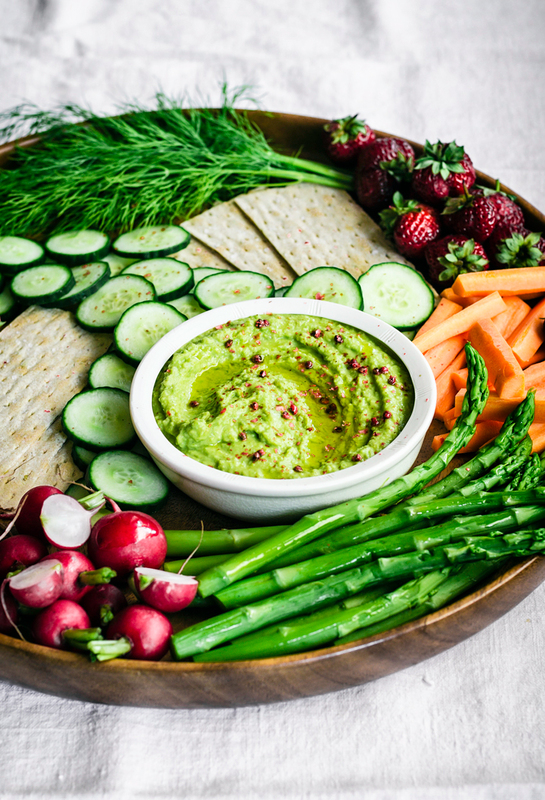 Green pea hummus is slightly sweet, silky smooth, and the prettiest pastel green colour. We’ve been eating it the past couple of days with red lentil falafel, and with simple sandwiches of just buns, hummus, and veggies. I fell in love with having a little sweetness in my hummus and this is a nice way to bring that into spring without buying out of season sweet potatoes. Like most hummus, this takes about five minutes to make and just needs a handful of ingredients. It does keep well in the fridge, in terms of taste, but the colour fades slightly after a day or two of storage. I’ve tried it with both sesame oil and olive oil, and both are great – stick with olive for a more traditional flavour and go with sesame if you want to mix things up a bit and bring a slightly toasted flavour into the mix. Everything for the mezze is raw here apart from the asparagus, which I steam for a minute before serving. If you can get very thin and fresh asparagus, you can have it raw instead. Very chunky asparagus is preferred here in northern Germany, because the white variety is the norm, so finding young green stalks is tricky at best. Of course you can change the mezze to suit your tastes, or just make the hummus on its own, but it’s super fun like this. Hummus for ever! P.S. I also have a normal hummus recipe if this is a little too crazy for you. Let’s connect! 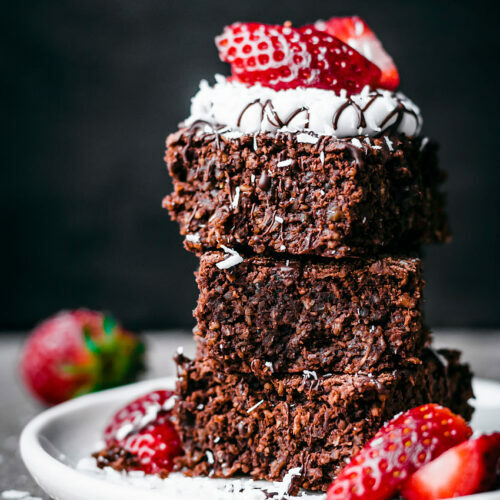 If you liked this recipe, make sure to leave a comment below, I love hearing from you! Tag me on instagram@occasionallyeggs and #occasionallyeggs so I can see what you’re making, and stay in touch via facebook, pinterest, and bloglovin. To make the hummus, add everything except the oil to the base of a food processor fitted with the blade attachment. Mix on high for a couple of minutes, or until mostly smooth. Add the oil in a slow stream while blending, until incorporated, and then blend on high until the hummus is completely smooth. 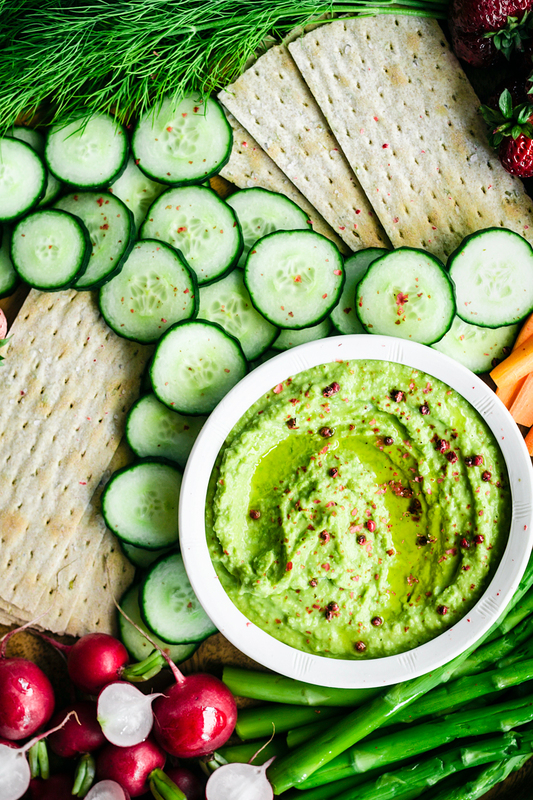 Place the hummus into a bowl, top with a little more oil and pepper, and serve with the spring mezze ingredients or simply with naan. * To steam the asparagus, trim the ends and then place the asparagus into a pot with a few centimetres of boiling water for a minute or two, until bright green but still snappy. Love your food, love to eat it! N best of all love being vegan. Can i come over ??? ?